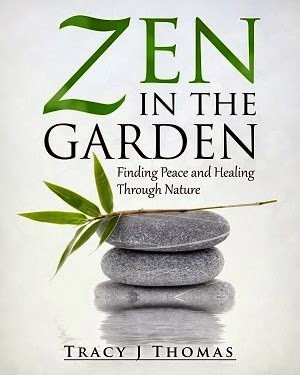 Today we are interviewing Tracy J Thomas, author of the nonfiction/motivational book "Zen in the Garden: Finding Peace and Healing Through Nature." I am an award-winning photographer, artist, author, and educator living in Northern California. I received my M.F.A. in Photography from the Academy of Art University, San Francisco and my work has appeared in mainstream publications, galleries, and personal collections around the globe. I am a contributing author to the 2012 Seal Press anthology "Dancing at the Shame Prom: Sharing the Stories That Kept Us Small and served on faculty at the San Miguel Writer's Conference and on the "Women Write Their Lives" speaker's panel in San Miguel de Allende, Mexico. "Zen in the Garden" came about in the midst of my treatment for skin cancer. It is my way of sharing the healing power of nature through the Zen philosophy of mindfulness. My goal when writing this motivational book was to encourage spiritual awareness through helpful anecdotes and inspirational nature photography. My hope is my readers will slow down and experience the transformational beauty that exists in the small details that surround them on a daily basis. Who do you think would most appreciate "Zen in the Garden"? Anyone who is experiencing the stress of a fast-paced, noise-filled life and would like to take some constructive steps towards attaining peace and healing. What inspired you to write a book about promoting peace, healing, and happiness through the Zen philosophy? The past few years have been difficult for me. For the first time in my life I experienced health issues that resulted in a lot of stress and fear of the unknown. I found myself consumed with thoughts of "what if" and struggled to find peace of mind. One day in the midst of this stress I grabbed my camera and decided to take macro photos in our garden. I became so mesmerized with the minute details and beauty unfolding before me that I literally forgot about my fears and felt my body let out a deep sigh of relief as I relaxed into the moment. This became my daily routine during my treatment. When I became housebound I would meditate on my nature photographs and soon realized I felt the most peace and happiness when I thought about beautiful moments in my life. I began to write down my thoughts and felt moved to share these things with others who might also feel stressed. Thus the book was born. What is it about the Zen philosophy that helps people find peace amid a chaotic life? The practice of mindfulness, living in the moment, is a beautiful and simple concept. This is the aspect of Zen philosophy that has always resonated the most with me personally. Our busy, chaotic, and noisy lives cause us undue stress and anxiety which can lead to illness. Our minds tend to work overtime and are often overwhelmed with shame and regret for things in our past and fear of things we think might happen in the future. When we become overwhelmed with these thoughts, there is little room to enjoy the moment and we miss out on an enormous amount of beauty. The Zen philosophy of mindfulness allows us to clear our minds of all the unnecessary muck, thus releasing stress, and helps to bring about a spiritual awakening to the moment at hand. How did you make the Zen philosophy approachable for people who have never practiced Buddhism? I myself am not a practicing Buddhist in the traditional sense although I have studied books by Buddhist authors and do utilize meditation as a daily practice. For me the concept of mindfulness was transformational. For years I suffered from a mind that just wouldn't quit. I was always stressed about the past or worried about the future. When I spent time in nature, whether climbing a mountain peak or planting my garden, it always helped to alleviate that stress and quiet my mind. When I would leave those places the overwhelming stress would return. It wasn't until I began to practice mindfulness in all circumstances of life that the stress became manageable and I began to experience more peace and happiness. The book is written in a practical way that provides anecdotes to ponder, inspirational photographs to meditate on plus gardening tips and nature challenges to encourage readers to take action and begin to experience the small, beautiful things in life. Mindfulness is one of the basic tenets of Zen philosophy that doesn't require years of study and this book presents the concept in everyday terms. My hope is readers of "Zen in the Garden" will begin to recognize the small beauties in each moment and realize the importance of living our lives right now. None of us truly know how much time we have so why waste it away on stress and negative energy? I am currently working on several books. The next in line for publication is another motivational book on the concept of compassion that will challenge readers to perform one compassionate act daily for thirty days. The working title is "30 Days of Grace: Changing the World Through the Act of Compassion." Your book seems like a real gift to someone who has never tried mindfulness. That can be difficult in our fast paced and stress filled society. But when we take the time to notice and appreciate those small moments, then we can handle whatever life throws our way with ease and grace.